Populations of the endangered Indus river dolphin are becoming even scarcer as more water is being used for irrigation and the rivers are becoming more fragmented, a new study says. The freshwater dolphins live in the lower part of the Indus River, which is in Pakistan. The species is endangered, with only around 1,100 dolphins remaining in the world. The mammals are confined to a 750-mile stretch of the river, and are also divided into isolated populations due to six barrages. Researchers looked at current dams, dam construction, the length and width of the river, and other things for their study. In the end, they found that dams have fragmented the dolphins into 17 isolated populations. In 10 areas, those populations have disappeared. Six areas are still populated by the dolphins, while the status of the Indus river dolphin is unknown in one area. Irrigation at diversion dams have been causing low dry-season river discharge, and researchers believe that this is the main reason why the dolphin populations are dying out. 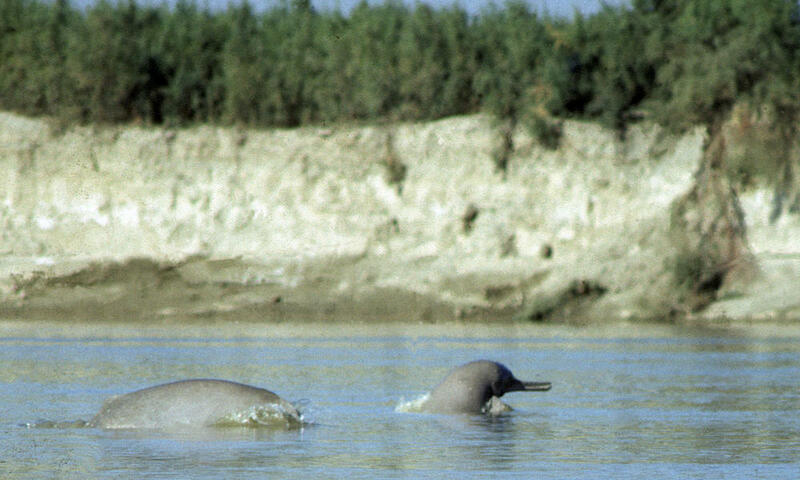 “This important study shows that it is river habitat fragmentation by dams, and removal of river water for irrigation that has caused the massive range decline of the Indus River freshwater dolphin,” said Gill Braulik from the Wildlife Conservation Society, who is one of the study’s researchers. By examining why the population are dying out, the researchers hope to raise awareness about the environmental problems dams can cause. “This increased understanding of species decline in fragmented river systems is especially important because hundreds of new dams and water developments are planned or are under construction in many of the world’s rivers and large losses of aquatic biodiversity can be expected,” Braulik explained.